the excitement of present day adventures." 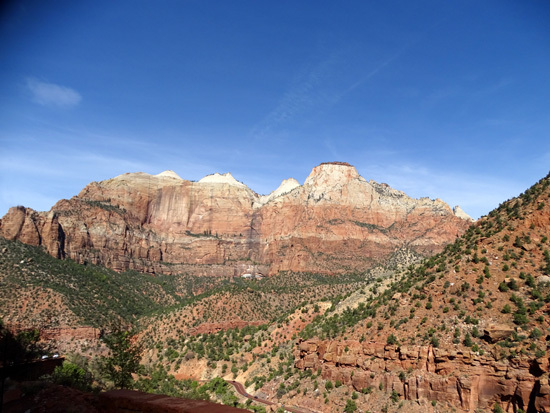 It has been decades since either Jim or I have been through Zion National Park. 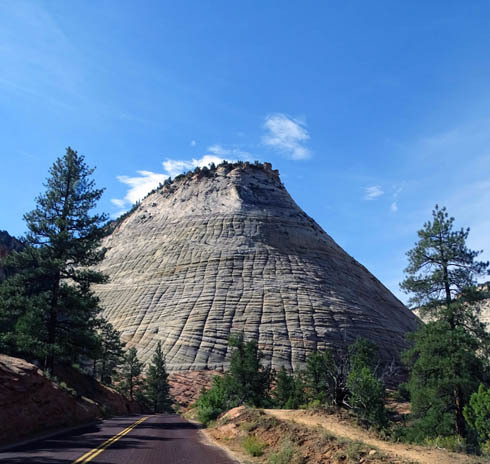 Since we'd like to spend a week or more exploring the park this fall or next spring, we decided to drive over there on a sunny Thursday morning when we thought it might not be too crowded and check it out. 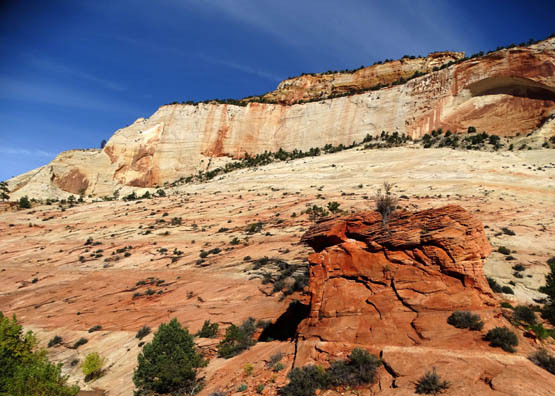 Zion is one of five national parks in Utah's canyon country. 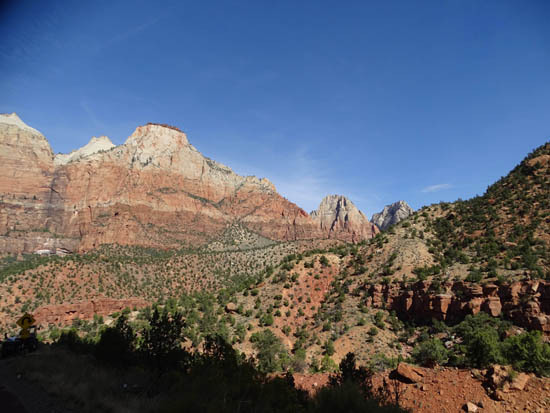 Over 3.6 million people visited Zion in 2015, putting it sixth on the list of most popular U.S. national parks this year. 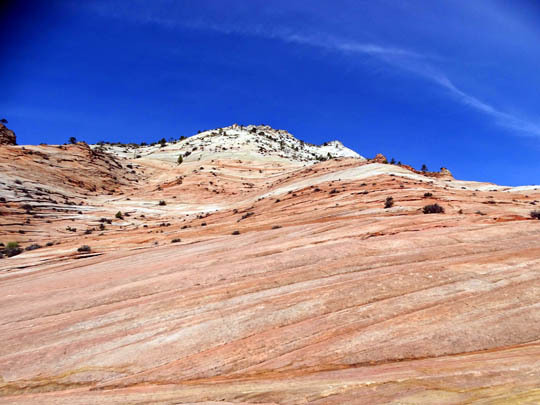 That was almost double the number of people who visited Bryce Canyon. 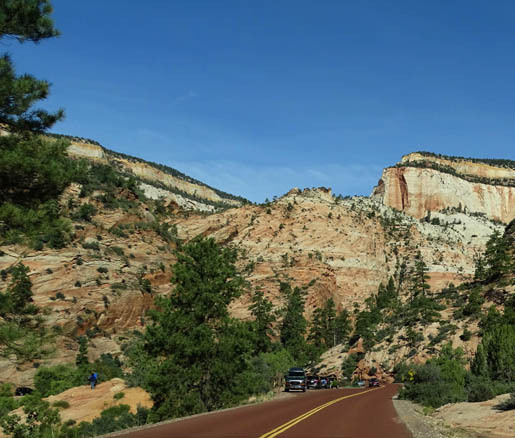 One big reason is access -- Zion is closer to I-15 and much easier for tour buses, RVs, and every other vehicle to reach. 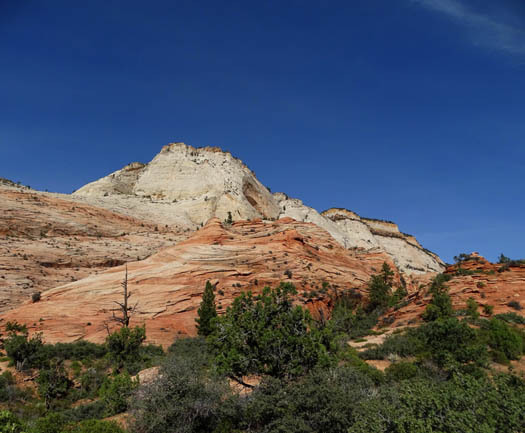 Zion's busy season is also longer because the park is 3,000-4,000 feet lower in elevation than Bryce Canyon. For various reasons Jim and I prefer Bryce Canyon so we were glad there were fewer people in that park, although sometimes it felt very crowded, too. This whole loop is very scenic. 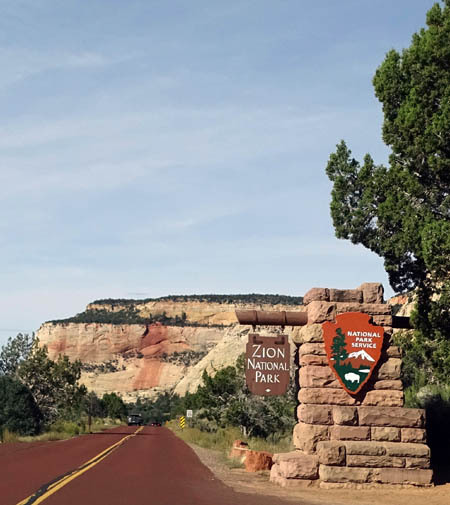 By incorporating I-15 we were able to visit the northern unit of Zion at Kolob Canyon on our day drive. It's a much less crowded area of the park. 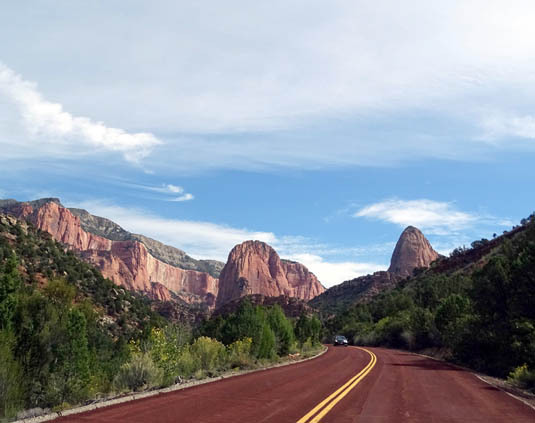 It wasn't long before that was our mantra as we were driving through the southern part of Zion. 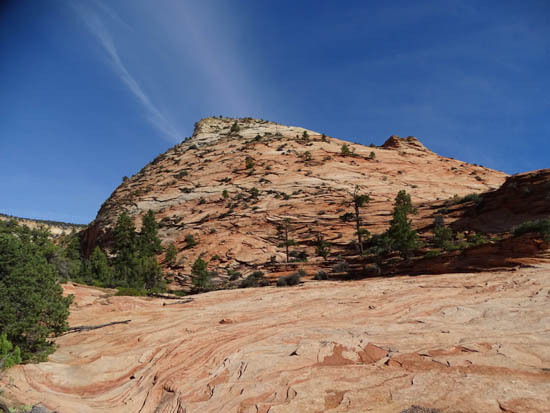 On this day trip we just wanted to re-familiarize ourselves with the terrain, ogle the scenery, and go into the visitor center to get more information about the trails. We also wanted to check out the campgrounds inside the park and along Hwy. 9. We didn't intend to do any hiking. 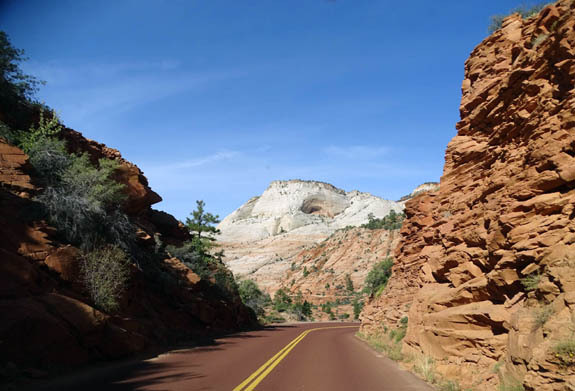 We had the dogs with us and knew it was too warm to leave them in the car; as in most of our national parks, dogs aren't allowed on the dirt hiking trails, just paved roads and the bike path. 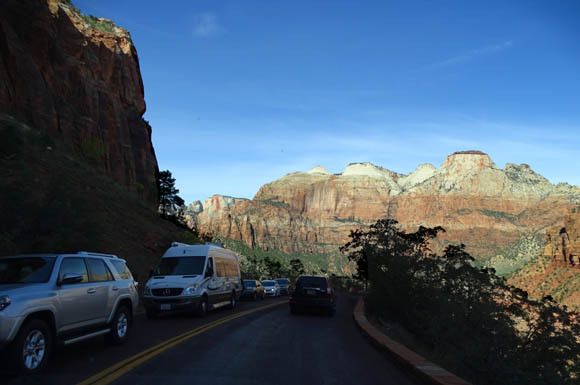 Because the park was so crowded we couldn't find a parking space for our car at the best overlooks on Hwy. 9 through the east side of the park. I did get some decent pictures through the car windows as Jim was driving, though. Nor were there any spaces in the large parking area at the visitor center so we didn't go inside. 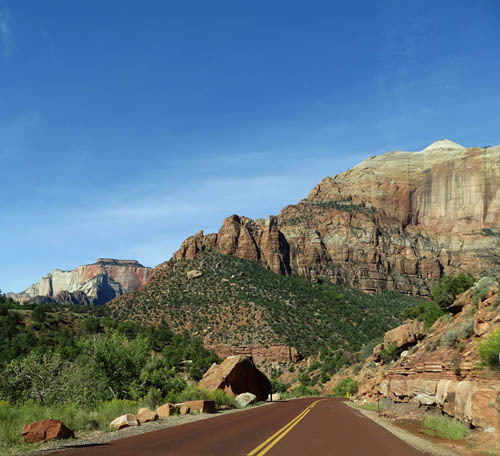 We already knew that we wouldn't be able to drive through popular Zion Canyon along the Virgin River to take photos. 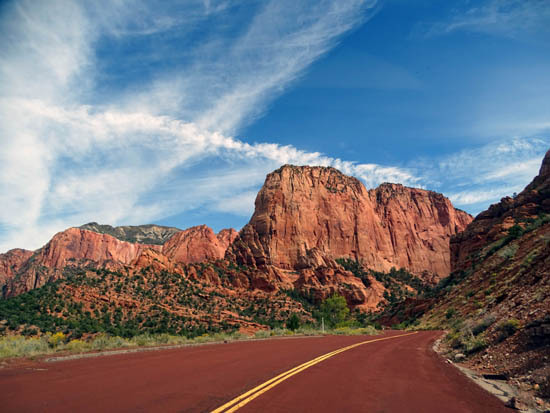 For most of the year visitors can't use their own vehicles for about six miles on the Zion Canyon Scenic Drive. 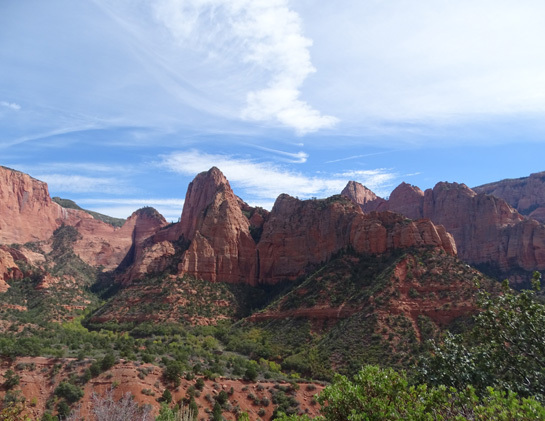 You have to take the free shuttle buses, ride your bike, or walk/run that road to access those popular overlooks, trails, and slot canyons. 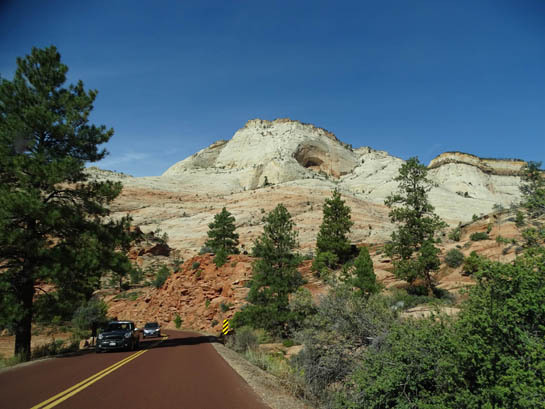 We approached Zion from the east on Hwy. 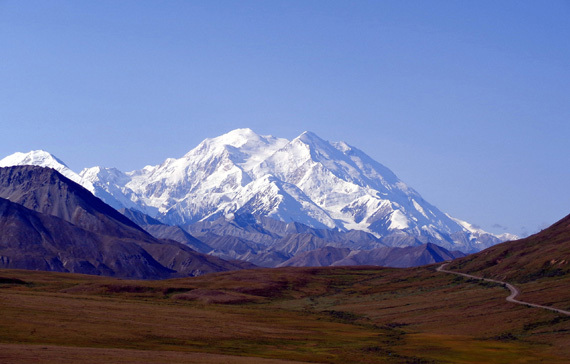 9, which runs generally east to west through the southern part of the park. There is an entrance gate there and another on the west side of the park in the town of Springdale. 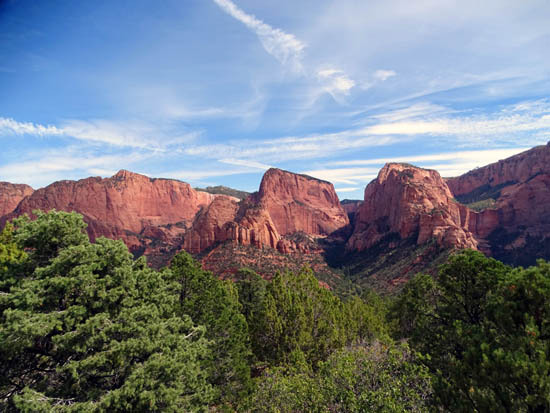 A third entrance gate is located at Kolob Canyon in the NW part of the park. 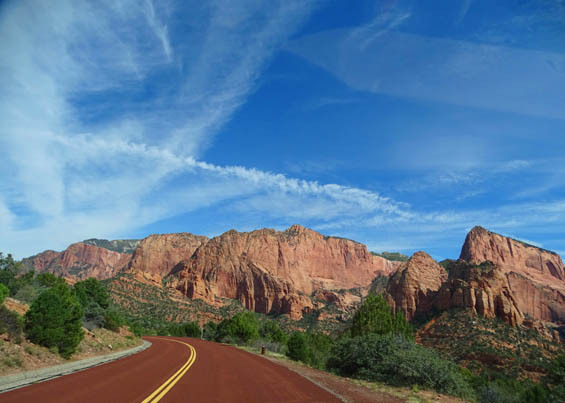 To the right at the intersection are all the scenic vistas and trails along the Virgin River. That's where visitors must use the shuttle bus system most of the year. 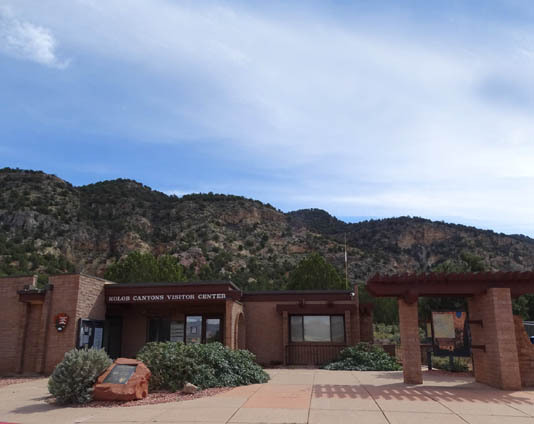 On our day drive we had to turn left toward the visitor center, shuttle bus stop, campground, and west entrance to the park. Before leaving the park we drove through the campground to see if there are any spaces large enough for our rig. There are a few but none are available when we want them this fall. We continued driving through the touristy town of Springdale on Hwy. 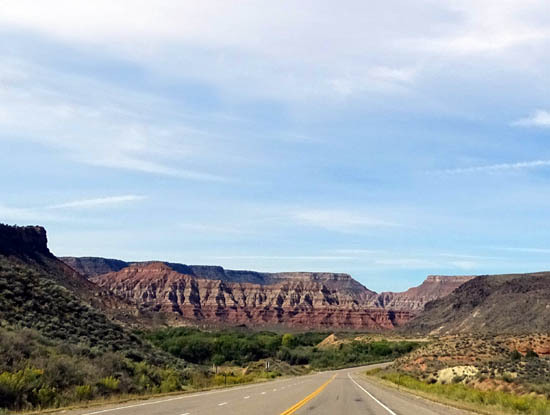 9, eye-balled a couple promising -- and full -- private RV parks for later, turned right on UT 17 at LaVerkin, and headed north on I-15 for a few miles. 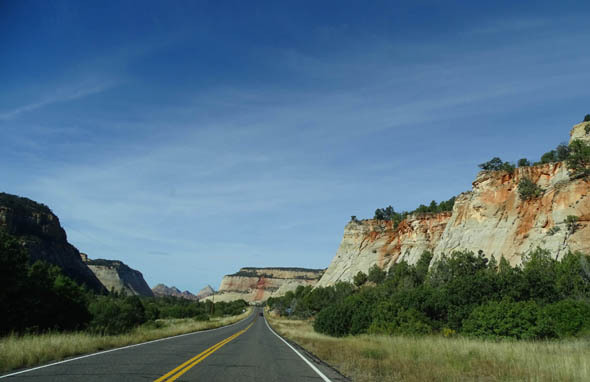 Although this part of Hwy. 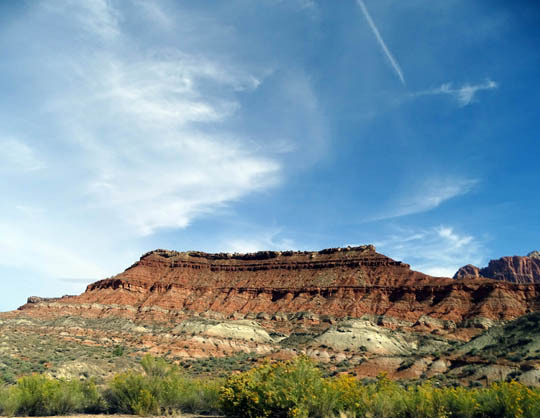 9 and all of UT 17 are outside park boundaries there are views of the mountains and cliffs in the park the next 50 miles or more. 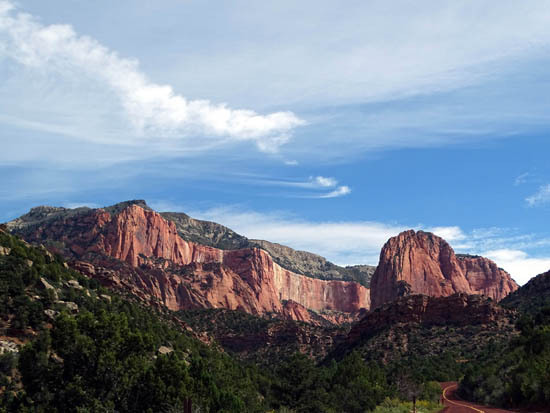 There is an exit on the freeway at MM40 for the northern unit of the park, Kolob Canyon. We stopped at the visitor center to show our pass and ask some questions. 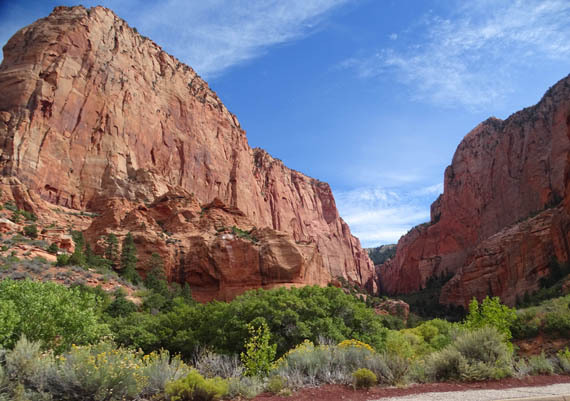 Many fewer people visit this unit of the park because it's not as spectacular as the Zion Canyon part but it's worth a look if you're in the area. 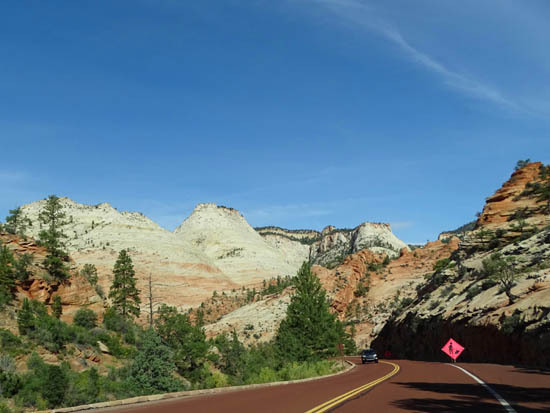 You can drive your own vehicle on the park road whenever it's open. It deadends at a large overlook with picnic tables and interpretive panels. A dark vertical strip indicates a waterfall; there is a large hanging garden above it. 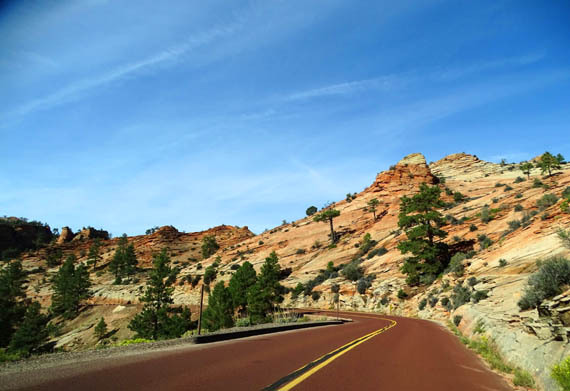 Because it's getting down to freezing some nights in mid-October at 7,000 feet elevation, Red Canyon Village RV Park is closing on October 18. 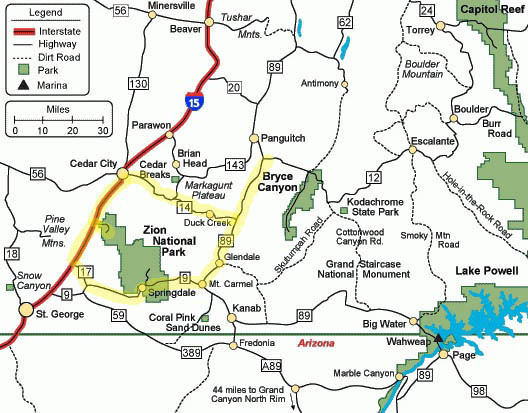 However, it's still in the high 90s F. in Black Canyon, AZ, where we plan to spend at least the first part of the winter season. That's too hot for us! We've been trying to figure out what to do for two or three weeks while we're waiting for the temperatures to drop in the Phoenix area. 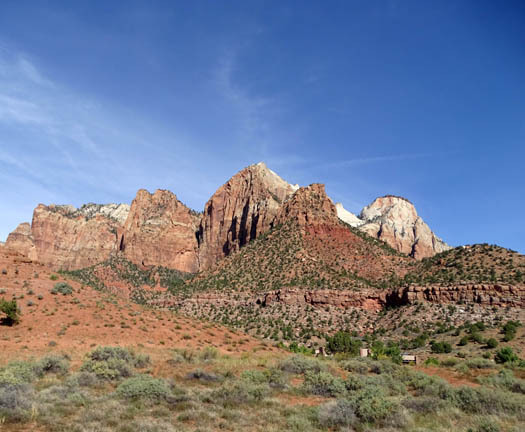 One idea was to find a campground closer to Zion and hang out there. 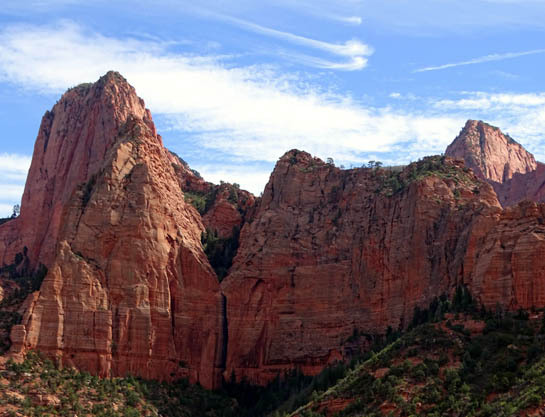 But since it's still so busy we have decided to wait until after spring break in 2016 to visit Zion for a week. We have reserved a spot at a private campground close to the west entrance gate in Springdale. 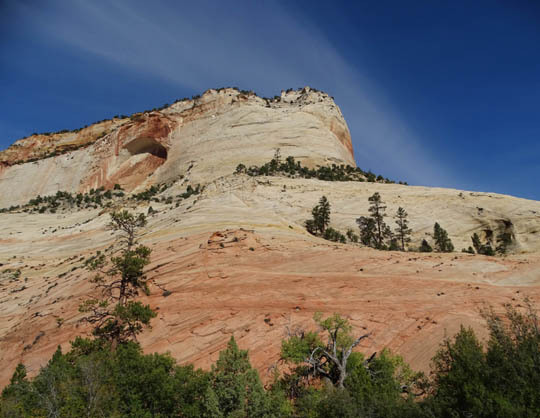 See the 2016 journal for more information about the park and its trails. 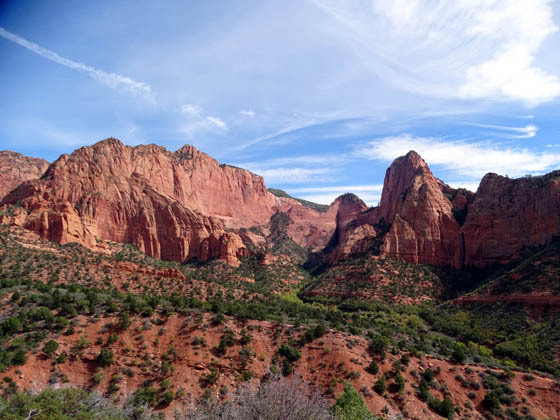 Another idea to kill some time in an area new to us is to camp in Kanab, UT, Jacob Lake (closer to the North Rim of the Grand Canyon), or the southern end of Lake Powell since we'll be going down that way to Black Canyon. 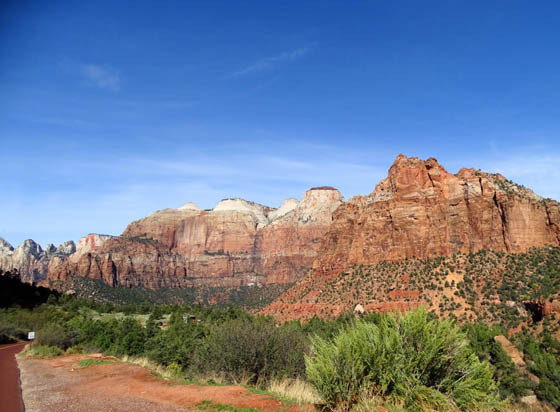 So we did another day trip to check out Kanab and Jacob Lake.